Today I found out how the Black Friday tradition got started. While it wasn’t called “Black Friday” until the 1960s, and then not popularly called such until the last two decades, retailers have been trying to push people to shop the Friday after Thanksgiving since the late 19th /early 20th century. Around this time, it was very popular for various department stores, such as Macy’s and Eaton’s, to sponsor parades that would occur the day after Thanksgiving. These parades would typically be a major part of Christmas advertising campaigns by these stores. This, in turn, would ultimately result in a lot of people going shopping after the parades were over. Over time, this melded into a commonly accepted unwritten rule among most major department stores to hold off on their major Christmas advertising pushes until after Thanksgiving; specifically, to hold off until after these parades were over. By the 1930s, the Friday after Thanksgiving had become the official start of the Christmas shopping season among the vast majority of retailers out there. However, this tradition ultimately resulted in retailers being unhappy with the length of the Christmas shopping season on Novembers where the last Thursday was the fifth Thursday in November (Thanksgiving at that time was always on the last Thursday of November). Thus, with the strong encouragement of lobbyists for various retailers, President Roosevelt, in 1939, decided to change the official date of Thanksgiving to be on the second to last Thursday in November, in order to lengthen the Christmas shopping season as much as possible, with the hope that it would boost sales for retailers and, thus, boost the economy. However, when Roosevelt changed the official date of Thanksgiving to a week earlier in 1939, many people refused to change the date they held Thanksgiving that year and mockingly called the official government set Thanksgiving holiday, “Franksgiving”. In fact, a full 22 states refused to go along with Roosevelt’s date, which continued for the next two years. Texas, on the other hand, decided to take both holidays and held two Thanksgivings. In 1941, in order to fix the multiple dates for Thanksgiving issue, congress passed a law, and later amended it, that for the first time officially set the date for Thanksgiving into U.S. law. The date they finally set, which Roosevelt ratified, was the fourth Thursday in November, which would sometimes be the last and sometimes be the second to last. In any event, the term “Black Friday” wasn’t coined to describe the day after Thanksgiving until the mid 1960s. Even then, it wasn’t a popular term nationally until around the last twenty years. There are several suggested origins for this name. The most likely origin, which is reasonably well documented, is from Philadelphia police officers, bus drivers, and taxi cab drivers who dreaded the day after Thanksgiving due to the traffic problems and the massive amount of people out and about. In Philadelphia, it became customary for officers to refer to the post-Thanksgiving days as Black Friday and Black Saturday. Hardly a stimulus for good business, the problem was discussed by… merchants with their Deputy City Representative… He recommended adoption of a positive approach which would convert Black Friday and Black Saturday to Big Friday and Big Saturday. “Big Friday” never caught on, but over the next decade, more and more references can be found in various newspaper archives of this particular Friday being called “Black Friday” for this reason. In the 1980s, retailers, unhappy with the negative connotations of what appears to be the real origin of the term, decided to start pushing that the actual origin was that most retailers operated in a financial loss for most of the year and Black Friday was named such because it was the day of the year when the retailers would finally see a profit, moving out of the red and into the black. This of course, simply isn’t true. While there are some retailers that depend on the Christmas season’s profits to make a profit for the year, most retailers see profits every quarter based on the quarterly SEC filings of those major retailers. There are also no references to this potential origin predating around the 1980s and there are numerous references to the previously listed theory before that time. A lesser theory that is sometimes spread about is that this naming came from the stock market crash in late 1929 which kicked off the Great Depression. In fact though, that event happened on a Tuesday, not a Friday. The actual “Black Friday” stock market scare happened in 1869, was in September, and had to do with gold prices, so in neither case had anything to do with shopping or the Friday after Thanksgiving. While we’re on the topic of Black Friday myths, it should be noted that Black Friday is not the biggest shopping day of the year. In fact, it’s typically not even in the top five, though has cracked the ranks a few times. The real biggest shopping day of the year is nearly always the Saturday before Christmas, except when Christmas falls on a weekend day, in which case the biggest shopping day of the year is usually the Thursday or Friday before Christmas. Thus, the procrastinators seem to outnumber the early birds. 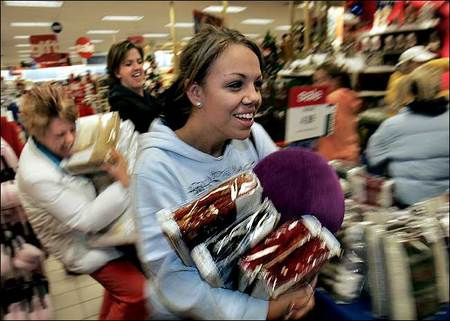 Nearly 135 million people go out to shop on Black Friday every year. In 2008, Jdimytai Damour, a Long Island Walmart temporary employee was trampled to death on Black Friday when shoppers at Green Acres Shopping Center, impatient with waiting for the store to open, pushed against the doors to try to get them to open. Workers pushed back to try to keep the doors from breaking, but ultimately the masses won out and over 2000 people streamed in, trampling Damour. The paramedics who arrived and tried to save Damour were also trampled and seriously injured by shoppers who apparently didn’t care that there was a dying man lying at the entrance of the store with paramedics trying to resuscitate him. All total, five shoppers had to be hospitalized at that one location and many more were injured. Black Friday is also the same date as “Buy Nothing Day”, which is a movement against consumerism. Shop.org executives came up with the bright idea for “Cyber Monday”, even though the Monday after Thanksgiving historically never previously saw any up-tick in online sales over any other day around that time, with online sales seeing their actual peak days between December 5th and December 15th. This campaign has seen marginal success, but not enough for most online retailers to latch on to the idea. Instead, there has been a big push lately for “Cyber Black Friday”, encouraging people to avoid the masses and stay home and shop online. This campaign has been much more successful than Cyber Monday, with sales reaching as high as a half a billion dollars in 2009, which is over double what it was in 2008 thanks to this marketing push. As mentioned, the term Black Friday itself was first used to describe a stock market crisis on September 14, 1869. At the time, gold prices were almost solely controlled by investors in the New York Stock Exchange. Specifically, James Fisk and Jay Gould headed an investment group that sought to control the price of gold, at that time owning the rights to nearly 50% of all gold circulated in the United States. The one flaw in their plan was that the U.S. government occasionally released gold reserves for sale in order to regulate the price of gold and keep paper money valuable. To get around this, the investment group recruited President Grant’s brother-in-law to convince Grant to appoint Daniel Butterfield as the assistant to the Treasurer; Butterfield had agreed that he would do his best to make sure the government would not release any of their gold holdings and would tip this investment group off when the government was planning on selling gold, so that the investors could first drive up the price of gold and then sell large portions of their gold holding for profit before the government release drove down prices. The problems started when this group was too successful, driving gold prices up by nearly 15% in a single day at one point. This had a consequence of rapidly decreased the value of paper money, which was not backed by gold. When Grant finally realized what was happening, he ordered the federal government to sell $5 million in gold to counteract this group’s efforts. Within minutes after this gold hit the market, the price of gold plummeted resulting in an investor panic, which ultimately caused a huge stock market drop, ruining many. Interestingly, because Fisk and Gould were tipped off the day before this government release, they were able to sell off much of their gold holdings to various groups. Fisk and Gould made a tidy profit while the groups they sold to were ultimately ruined the next day when the government gold hit the market.